Click photo to download. 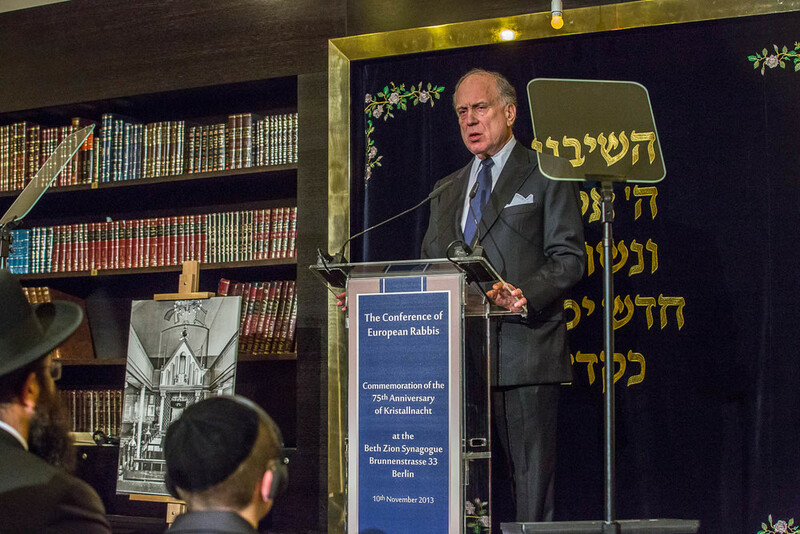 Caption: World Jewish Congress President Ronald S. Lauder addresses the Conference of European Rabbis commemoration of the 75th Anniversary of Kristallnacht in Berlin on Nov. 10. Credit: World Jewish Congress. While commemorations for the 75th anniversary of Kristallnacht took place around the world last weekend, remembrance of the atrocity does not address the problem of modern anti-Semitism, which is often masked as anti-Zionism, the Simon Wiesenthal Center says. During Kristallnacht, the “Night of Broken Glass,” from Nov. 9-10, 1938, Nazi officials and German civilians killed more than 1,000 Jews (according to the Simon Wiesenthal Center) and vandalized more than 7,000 businesses, a turning point in the Nazi era that foreshadowed the Holocaust atrocities to come. Earlier this month, German Chancellor Angela Merkel called Kristallnacht “one of the darkest moments in German history.” As part of the commemorations during the anniversary weekend, Germans in Berlin polished about 5,000 “Stolpersteine” (stumbling blocks), plaques marking the names of Jewish Holocaust victims next to their last known addresses. About 120 Berlin-area stores located in areas of the city that were targeted in 1938 stuck adhesive posters to their shop windows displaying patterns of broken glass. But according to Dr. Shimon Samuels, director for international relations at the Simon Wiesenthal Center, Kristallnacht has been made into “an icon by left-wing anti-racist movements in Europe.” While those movements commemorate the atrocities of the Holocaust, their definition of racism also includes the state of Israel and its grievances against the Palestinians. Meanwhile, seven decades after the Holocaust, modern European Jews are still significantly affected by prejudice. Almost one-third (29 percent) of European Jews have considered emigrating over the past five years because they did not feel safe as Jews in their home country, according to a survey released last weekend by the European Union Agency for Fundamental Rights. Twenty-one percent of respondents experienced anti-Semitism through a physical attack or another form of harassment during the last year, and 52 percent said they fear their children will be subjected to a physical anti-Semitic attack. Additionally, an October poll from the same European agency revealed that many European Jews hide their faith in public due to fear of anti-Semitism, including about half of 800 respondents from Sweden. In many cases, the “anthropoligization” of the Holocaust in Europe has made it into “a camouflage for hate itself,” Samuels told JNS.org. For instance, Samuels noted, the Berlin Jewish Museum organized an international conference titled “Anti-Semitism in Europe Today: the Phenomena, the Conflicts” to mark Kristallnacht’s anniversary, featuring anti-Zionist keynote speaker Brian Klug. Klug is “a British Jewish anti-Israel activist who, by commission or omission, gives cover to anti-Semites among the extreme left and the BDS (Boycott, Divestment, Sanctions) campaigners,” Samuels wrote in a Nov. 4 Israel National News op-ed addressed to Germany’s Merkel. Dr. Klug is “an important voice in the debate on the definition and characteristics of anti-Semitism,” she said, adding that Klug was invited to other conferences organized by global Jewish organizations. “Because there is no consensus on this subject, it is all the more important that we hear a range of views. It is for this reason that we also asked [sociologist Detlev] Claussen, another eminent scholar in the field, to comment on Brian Klug’s paper… We oppose any attempt to close down debate and silence dissenting voices on political grounds,” she added. Although Germany and Europe “are a much better place than they were” during the Nazi era, the problem today is “the growing, visceral hatred of the Jewish state throughout Europe,” World Jewish Congress (WJC) President Ronald S. Lauder wrote in an op-ed on the WJC wesbite for the anniversary of Kristallnacht. “The importance of Kristallnacht has to be seen in its historical context,” Dr. Efraim Zuroff, director of the Simon Wiesenthal Center in Israel, told JNS.org in an email statement. Zuroff is known worldwide as the center’s top Nazi hunter. Kristallnacht occurred not long after the Evian Conference in the summer of 1938, when delegates from 32 countries met and shared their sympathies for Germany’s persecuted Jews. But most Evian delegates, including those from the U.S. and Britain, offered excuses for why their countries could not accept German-Jewish refugees. The Munich Agreement of September 1938 handed over the Sudetenland area of Czechoslovakia to Nazi Germany. Then, in October 1938, 17,000 Polish Jews living in Germany were unilaterally expelled back to Poland without that country’s permission, leaving them stranded on the Polish border. “This constellation of events convinced the Nazi leadership that they could accelerate their plans to exclude the Jews from German society and economy and upgrade the level of violence against them, without any serious and particularly harmful negative repurcussions from the West,” Zuroff said. “The result was Kristallnacht, which only helped convince the Nazis that their thinking on these issues was correct,” he added. “Kristallnacht [was] the prelude” to the subsequent Holocaust atrocities, Samuels said. According to Ethan Katz, a University of Cincinnati historian, “before Kristallnacht many Jews had retained the hope that the anti-Semitism of the period would pass.” Many German Jews saw themselves as fully German, but “in the broken glass of Kristallnacht, these dreams and delusions… became shattered,” he said. “Indeed, a major part of the horror of this event was that the same Germany that had produced great art and literature and philosophy and a culture in which many Jews felt so integrated had now produced hatred and destruction on a scale seldom seen in Jewish history,” Katz told JNS.org. Outside of Germany, at the Yad Vashem Holocaust Memorial Center in Jerusalem, Holocaust survivors remembered Kristallnacht’s 75th anniversary and shared their experiences with World War II veterans, IDF soldiers, high school students, and other survivors on Sunday. Earlier in the week, the U.S. Holocaust Memorial Museum marked the anniversary with a meeting between Holocaust survivors and German Ambassador to the U.S. Peter Ammon, according to the Washington Post. “As we mark this anniversary, let us act in keeping with the lessons of that dark night by speaking out against anti-Semitism and intolerance, standing up to indifference, and re-committing ourselves to combatting prejudice and persecution wherever it exists. In so doing, we honor the memories of those killed and reaffirm that timeless call: ‘Never Again,’” U.S. President Barack Obama said in a statement. “Attempts to decontextualize the Holocaust and turn it into a basis for political comparisons and attacks have become rampant—in American politics, in certain contexts in Europe, and in debates around the Israeli-Arab conflict. Without extreme care and precision, such references generally distort more than they reveal,” said the University of Cincinnati’s Katz. “In particular on this occasion, we should be focused on the tremendous loss for world Jewry that Kristallnacht embodied and accelerated; the way it shattered for many Jews their relationship to a German civilization they identified as their own; and the manner in which, 75 years later, we are reminded that we still have much to learn about the thin line between human civilization and the capacity for cruel barbarity,” he added. Posted on November 11, 2013 by Alina D. Sharon/JNS.org and filed under Holocaust, World, Features and tagged Holocaust.